Do you think that the new Galaxy A (2016) series warrant their pricing? Samsung announced its new midrange warriors without much fanfare yesterday, but that's not because the A3, A5 and A7 (2016) trio is lacking in virtues. The phones flaunt a brand new for the A-series glass design on a metal frame, reminiscing of the Galaxy S6 or Note 5. The other welcome change they took from the Note 5 are the extremely narrow side bezels, making the phones' one-handed operation easier. Samsung didn't stop here, though, and gave the new A-series much improved cameras, bigger batteries, fast charging, new processors, finger scanners, and updated screen characteristics, when compared to their predecessors. The European pricing for the 2016 edition of the A3, A5 and A7 has already been revealed by Samsung Netherlands. Given the USD/EUR exchange rate now, it should relay to an equivalent or slightly lower pricing in the US, if and when the phones launch here. 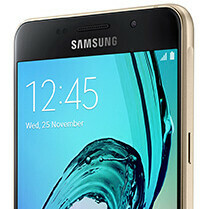 The Galaxy A3 (2016) will cost about €329 at launch, the A5 (2016) will be pegged at €399, while the Galaxy A7 pricing is yet to be disclosed for any market, but will likely be below 499 EUR or USD, considering the differential from the A3 to A5. These prices are a tad higher than the original A-series at launch, but the phones' boast much upgraded hardware and a new exterior, too. Given the handsets you can currently get in the $300-$500 range, we wanted to ask you whether you think that the A3, A5 and A7 (2016) are charging a "Samsung premium," or if you consider their pricing reasonable for what they offer. Take a side in the poll below, and tell us what you think about Samsung's new design and pricing approach to its A (2016) midrangers. Yes, premium quality phones above all. Yeah, wait for 3 months to go the prices down. in comparison to Xiaomi..... way too pricey. Xiaomi, cheap chinese company using 3rd party hardware vs Samsung who makes more than 90% of what goes into their own phones. Notice, cars that mostly use parts from 3rd parties are cheaper than cars that use first party parts. The pricing is actually just right considering what you are getting. Consider the A7 which is spec'd very similar to the iPhone, yet costs considerably less. If you want some cheap phone, then go get a cheap phone. Xiaomi cheap chinese company you juste made me laugh!!! Do you have one xiaomi phone? Please try one and then you can talk! Samsung are always way too pricey and after some months the prices go down as usual because it does not sell as it is suppose to! Xiaomi is nowhere near Samsung when it comes to top-notch quality! They are cheap. Please exoplain how they can spec a phone nearly identical to a Samsung be be $200 less in cost on average? Like I told the other guy this: "Xiaomi phones are all mostky sold at home. If they arent being exported anywhere than there is no additonal costs to cover. This vs the A- series which could end up on over 200 carriers WORLDWIDE vs sating on one continent. For anyone to compare the pricing of a product that stays on one continenet vs one that has potentail worldwide usage, just shows you fans know as much about business as a zombie. You guys are so foolish because you never consider surrounding factors. The Galaxy S pricing for example vs the iPhone is a perfect example. the S starts at 599 vs 649. Yet the S is sold on MORE carriers in MORE countries, yet offer 4 times the hardware prowness and has a slew of features that NO PHONE CAN MATCH. There is no phone sold in the whole world equal to the S, yet look how cheap it is. Sure some phones may benchmark faster but that is nothing when you compare the other stuff the phone can do. Also consider it costs more to make your own stuff vs subsidizing and buying parts from other vendors. Samsung basically only buys the camera sensor for there phone. They fabricate their own chips and models and they design and manufacturer the phone with exception of the glass/camera/audio." 90% of the parts in the Samsung are 1st party which means more cost to make available with YOUR own employees using YOUR own factories vs Xiaomi who buys 90% of the parts and only make their cases and all they need is a assembly plant. Dude they arent even remotely the same. Plus Galaxy phones are available in several markets, not just at home, which si more overhead and more costs. Also...EVERYTHING FROM CHINA IS CHEAP. ALUMINUM IS CHEAP. SAMSUNG PHONES ARE CHEAP TOO, but possess a higher quality of workmanship, better attention to detail, 1st party hardware, more features and more. Go get the Xiaomi and compare it to an equal from Samsung. Example, compare the Xiaomi Note to the Galaxy Note. The Xiaomi is roughly $400 while the Note starts at $699. Compare features, compare that the Note also has licensed hardware inside, consider 1st party components. Herehttp://www.gsmarena.com/compare.php3?idPhone1=6992&idPhone2=7431 see for yourself. Compare what you are getting and tell me if the Galaxy pricing isn't justified vs the Chinese knock-off wanna be. actually people are going to buy cheap mobiles. they only concern about the price. thats why samsung's flagship models lost there sale and the midrangers helped samsung in increasing of there sale. if the price of A series will high then people will go to buy other chinees phones like huawei and oneplus etc. I agree. For some peopel price is an issue. Here are the facts. Outside the US, most carriers outside the USA require you pay for your phone upfront. Or you have to make a hefty down-payment on the phones to walk out the door because outside the USA, carriers usually don't subsidize. So in Asian/India and similar countries where price is much more of a bigger issue, than yes your argument is well-taken and correct. But pricing isnt that much of an issue in the USA as we know because we have payment plans with all carriers because they too dont want to subsidize but at least still offer a cheap way to buy a fancier phone, and in many European countries price isnt that much of a deal either. When you live in a country where 90% of the phones sold are cheap anyways, those guys will chose a homegrown brand over an outsider. We see that in the USA and we have money. But with the quality Samsung possess, they shouldnt even compare on that level because they dont have too. In fact all they need to make is the A-Series and let that be the mid-range and make the S and Note for the top and then just have some Samsung cheapos for the cheap markets and they will makes lots more money. But I do also understand that most phone buyers dont understand pricing and dont understand that there are quality brands who offer better quality at similar price points. No they aren't. Here is what you aren't considering. How many carriers is the A-Series goign to be available at vs Xiaomi? Xiaomi phones are all mostky sold at home. If they arent being exported anywhere than there is no additonal costs to cover. This vs the A- series which could end up on over 200 carriers WORLDWIDE vs sating on one continent. For anyone to compare the pricing of a product that stays on one continenet vs one that has potentail worldwide usage, just shows you fans know as much about business as a zombie. You guys are so foolish because you never consider surrounding factors. The Galaxy S pricing for example vs the iPhone is a perfect example. the S starts at 599 vs 649. Yet the S is sold on MORE carriers in MORE countries, yet offer 4 times the hardware prowness and has a slew of features that NO PHONE CAN MATCH. There is no phone sold in the whole world equal to the S, yet look how cheap it is. Sure some phones may benchmark faster but that is nothing when you compare the other stuff the phone can do. Also consider it costs more to make your own stuff vs subsidizing and buying parts from other vendors. Samsung basically only buys the camera sensor for there phone. They fabricate their own chips and models and they design and manufacturer the phone with exception of the glass/camera/audio. Open your mind and stop with the stupid one-liners. no one reads your long, boring, defending Samsung to the end, long drawn out articles!! If you are selling a Samsung product a year old for over 50% of what you paid, then they are definately someone overseas, which the offer still seems cheap! definately not in America! No different than Kia's and Hyundais...depreciation is all you get with a Samsung device. heck, they don't even update the phones they release! Just say you don't. Others do. If you dont have anything better to say, just skip and move on. It's that easy. Or are you that stupid you don't know how? Techie, with all due respect, you are completely wrong and need to listen to fahad. Price is number 1 for many people who do not have the financial capacity to purchase high quality phones. Samsung upping the price is to a price almost as high as the Nexus 6P (at least in the US) is outrageous. This is why you must slow down with your giant posts. Sometimes, you do appear incredibly misinformed on particular topics. Elaborating further on something you aren't well versed in is a slippery slope. Challenge yourself for once and give yourself the chance to learn something and think logically. Phones for most people are nothing but a tool used to call people. Everyone in the world does not reflect the same interest you or I have in mobile tech. So, you're saying I don't have any experience with what Fahad is saying. Here is my experience. My wife is from the Philippines. I've visited their and spent a whole summer. Imagine me who has a awesome salary who can afford what he wants goign to a poor country for the first time where the average income is $350USD for a whole month. Now while I was their I saw what phones are available. I also know that Globe for example is their largest telecom. According to numbers, less than 10,000 Filipinos have purchase the latest iPhone 6S models because they cant afford them. The vast majority of them are still using old Nokias and many and I do mean many have moved over to Samsung, like the Samsung V and the Duos. I also understand that the vast majority of the people on this planet are not wealthy or have huge incomes. My retort had nothing to do with peoples finances. I also didnt exclude poor people, I just didnt directly address them. My point is simple, if you look at the samsung devices specifically and consider the facts I presented the A-Series is priced perfectly. if those phones arent cheap enough than it would require Samsung to use cheaper 3rd party hardware because 1st party hardware is NEVER going to be as cheap as 3rd party. Its simple math dude. I am not wrong, you just arent reading it right. I specifically said, since Samsung makes 90% of the phones components, they arent going to get any cheaper. Especially vs Xiaomi who is using ALL 3RD PARTY PARTS. Samsung phones use better options and have better features. You pricing is for some cheap Android running knock-off. You probably should go get one of those too. Techie. You really need to learn how to condense those sentences. Having said that, hope everything is well with ya. like what!!? I'm all ears! the hand waving gimmick over your phone, or the direct stare at your phone and your display stays lit, or laggy touchwiz, which Google has to help and give advice on. #30 techie take the advice of other posters and stop using up two pages to read on of your post! Samsung sells 300M phones per year. 50% of those phones are mid and low rangers. Their profits are low because it costs a lot of money to sell mid and low end phones at a profit, when you have to make them available at 300 carriers on 6 continents for what it costs you to provide 2 high end models to the same places. Consider the numbers man, both you and SamsungPhanboy. The S and Note account for 150M sales per year. If they didnt have teh low and midrange phones to darg them down and they only sold the S and Note, their profits would be way higher than Apple. Apple doesn't sell any phones below $400. Old models just fall to that point after being on the market even after Apple stops making them. Once Apple makes a sale on a phone to a carrier, they don't get one single dime from re-sellers and neither does Samsung. So if Apple doesnt make any phoens below $300, why should Samsung when they both sale similar quality products. In fact Samsung is better than Apple because Samsung makes their own s**t and Appel is liek Xioami buying parts and making a device. The math is simple. A phone filled with 1st party componenets will cost more than oen filled with 3rd party parts/ Apple doesnt care about peopel who cant afford to buy their phones. Mercedes and lamborghini doesnt care about people who cant afford to buy their cars. Samsung doesnt have to care about people who cant afford their phones. if you want better quality, better quality costs more money. I had the please while iN the Philippines to use a phone by Xioami. They are very nice phones, but they are not at the same quality as a Samsung, not even at the mid-range. Sorry they simply are not. It was the MI 4 (Me 4) I guess is how it would be pronounced. My wife's sister was able to buy one in Singapore over the summer It is a very nice phone. It is equal in quality IMO to an iPhone 4 in quality. It is worth IMO about $300 which is what you can get an iPhone 4 at now. It si not the same quality as the A5 or A7. maybe ist close to an A3. But again considering the phoen is 3rd party hardware and not 1st party, Samsung has the edge. That is my opinion which I am entitiled too even if you dont agree. I am not saying nor have I said the other guy was wrong. I am also not taking for granted Ilive in the USA. I am saying that people should buy what they can afford and dont expect every OEM to meet similar standards. Samsung quality and standards are much higher. In fact on the S and Note, higher than Apple. would you ask Apple to lower their standard just to release a $300 Phone? NO!? Then why should Samsung do it?! Agreed! What a lot of people are forgetting manufacturers still needs to make a profit. Remember the article on PA not so long ago. Most manufacturers that make android phones make very little profit per unit. Actually most are operating at a loss. Samsung only makes a few $'s per unit. If the price is as low as some of you would like it they will end up sinking and god forbid we are left with Apple. I don't care about price, iPhone 6s is more overpriced for sure. Why are this price surveys not done on Apple products? People already know the price for competing products. They are paying more for build quality and brand of samsung,Sony, lg,htc which the poor Chinese phones can't match. Because phonearena is biased towards apple. Likely to be on apple payroll. Delete my comment phonearena? You are right. Thats why you cant write any bad word against apple on phonearena, but you can against android or samsung. You're asking techblogs to commit profit suicide. Really? They did pretty well before the iPhone showed up. I never seen it be an issue.